Last Thursday, I attended the Women’s Association Boys & Girls Clubs of Southeastern Michigan’s Matilda R. Wilson (Dodge) Award luncheon, honoring Elise Fisher Hayes at the Bloomfield Hills Country Club. What I noticed what how many of the women in our community support each other’s events and fundraisers. 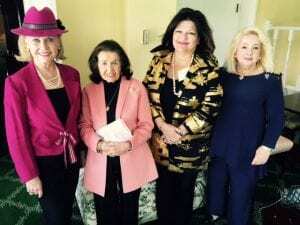 I was the guest of Bettina Gregg, president of the Women’s Division of Project Hope and at our table were five past presidents. I was able to snap a photo of four of them. These ladies are so dedicated and give selflessly to these organizations. In fact, Maggie had to run out because she and her husband were hosting another event that evening and she needed to prepare. She could have declined this event, but she didn’t. On June 2nd, I will be speaking at the Annual Meeting and Luncheon for the Women’s Division for Project HOPE. It will be a pleasure and honor to address these women who exemplify my topic, “The Life You Lead is the Legacy You Leave”. If you would like to attend, please email me at katana@katanaabbott.com or call Laurie Balian Aiello at 248-249-9478.